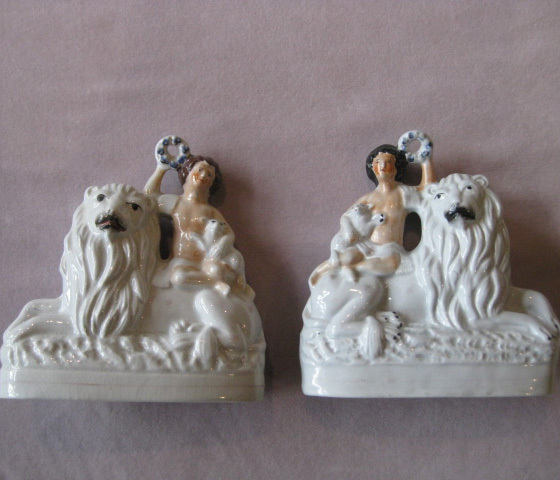 S2776: A rare pair of Staffordshire spill vases figures with a lion and lioness and their cubs and a snake curled around a tree. 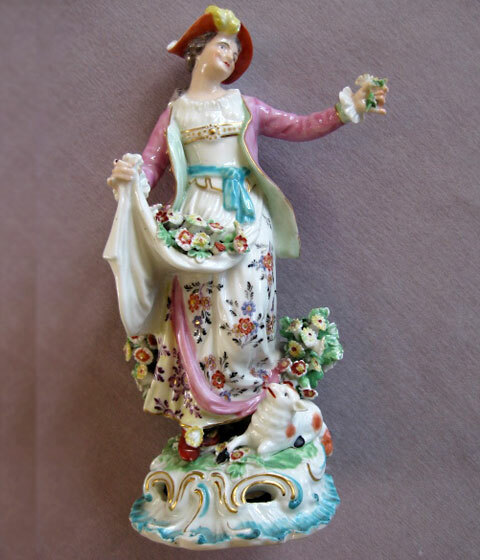 S2478: A Derby figure of a “Dresden Shepherdess” with a lamb at her feet and her apron full of flowers and standing on a rococo base. 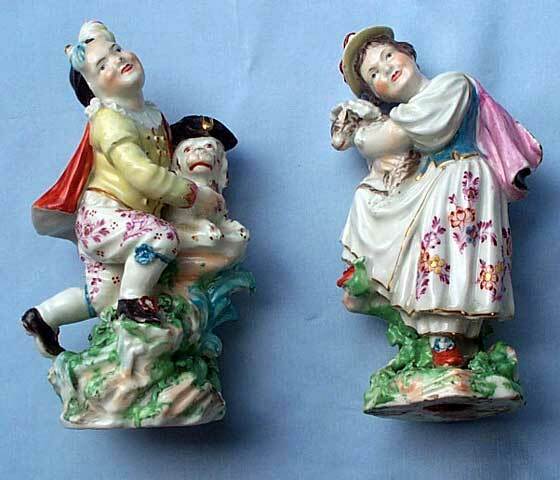 S1899: A rare pair of Derby figures of a Boy and a Girl . He with a macaroni dog and she with a cat. Patch marks and incised No 49 and a G to the base. 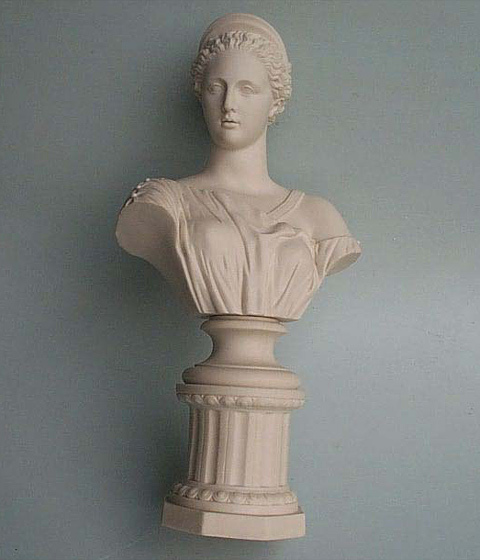 A fine parian bust of a Diana, standing on a fluted column. 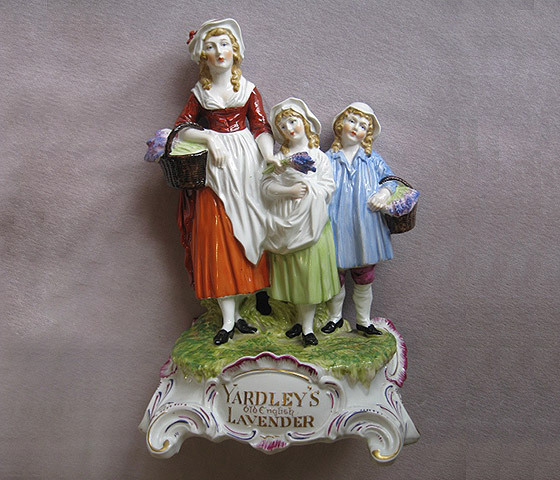 S2817 : A rare Derby candlestick figure of a boy piper decorated in the typical “pale family”palette. 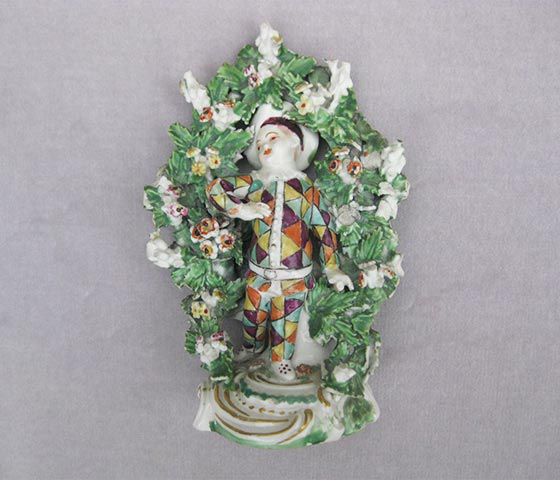 S2904 : A Derby biscuit figure finely modelled and representing Earth in the form of a gardener from a set on the Elements. Incised no 3 and patch marks. 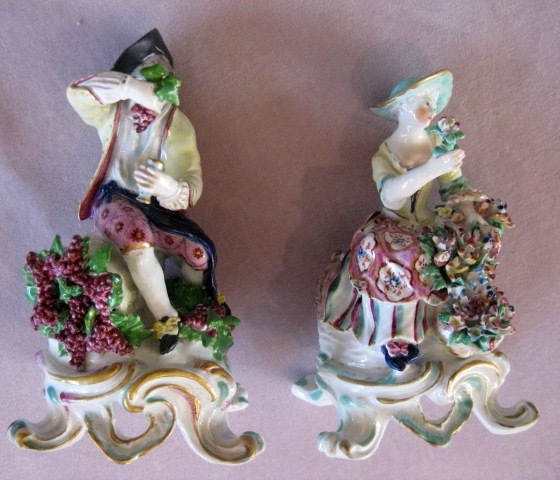 S2910 : A pair of Bow figures representing Spring & Autumn from a set of the Rustic Seasons set on a rococo shaped base. 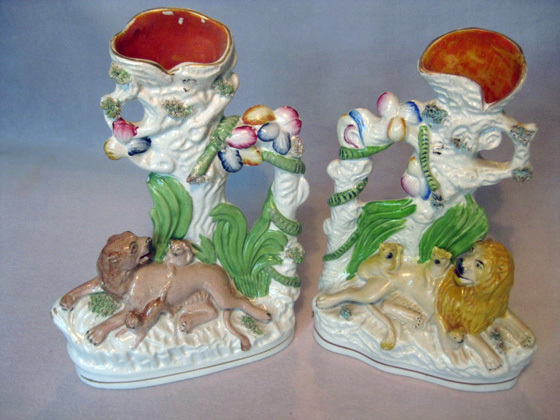 Unmarked Circa 1765 Height 6 1/2"
S2939: A rare pair of Staffordshire cow spill vases in russet and white and with further decoration of thistles beneath them. The base has the title “Milk sold here” in gilt. 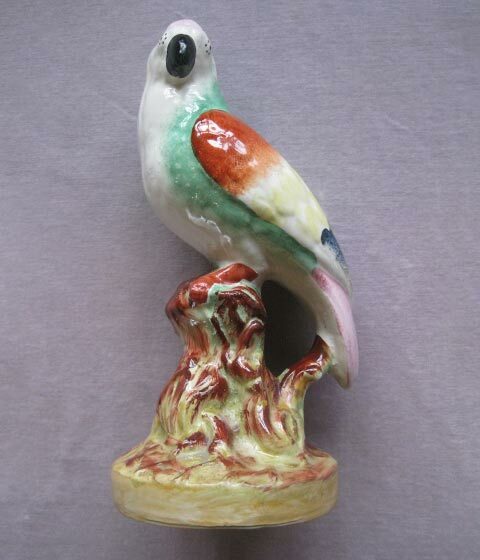 S2961: A late Victorian model of a parrot perched on a stump. 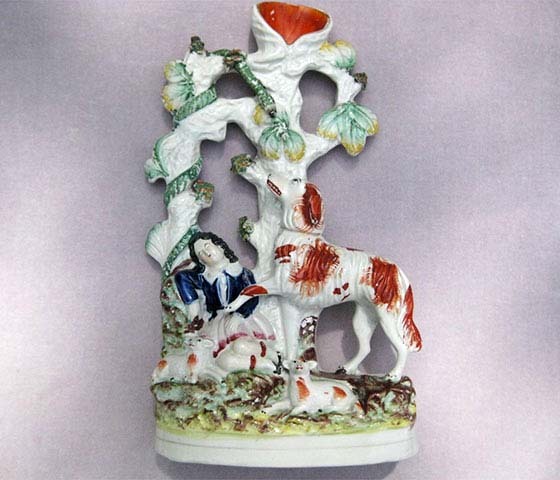 S2962: A Staffordshire figure of a girl asleep beside a tree with two lambs and a dog and with a snake entwined around a tree above her. 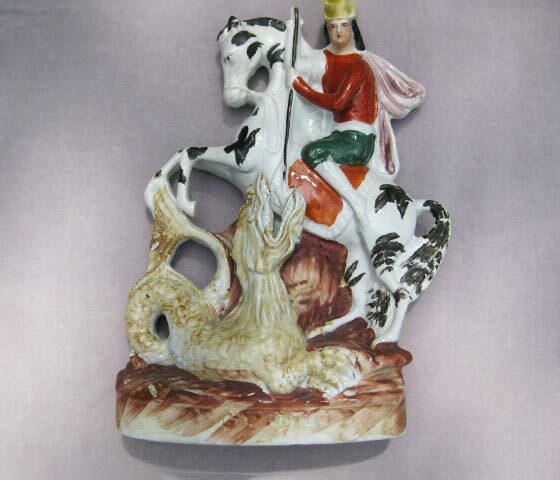 S2963: A rare left facing and titled Staffordshire figure of St George slaying a dragon. All other St George figures have him facing to the right. 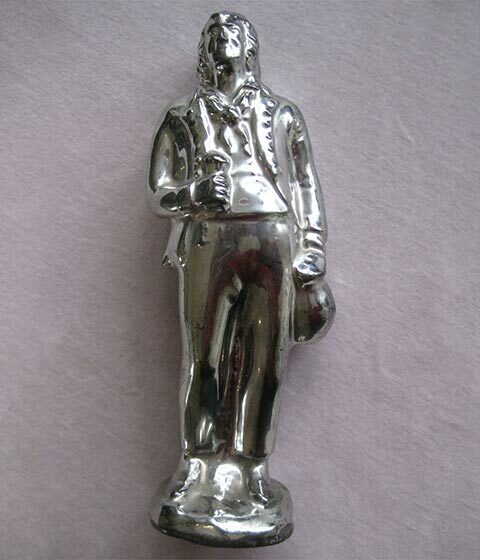 S2970: A rare red earthenware silver lustre figure of a sailor standing on a rounded base with a jug or money bag in his left hand a a glass in his right. S2971: A rare red earthenware silver lustre figure of Bacchus with a barrel behind him and with grapes in his right hand and an upheld glass in his left standing on a raised square base. 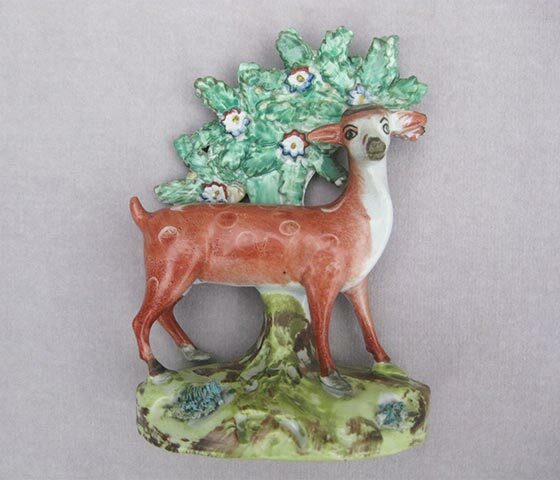 S2972: A rare red earthenware silver lustre figure of Venus standing on a square canted corner base with her arm around the tail of a dolphin with its head by her feet. 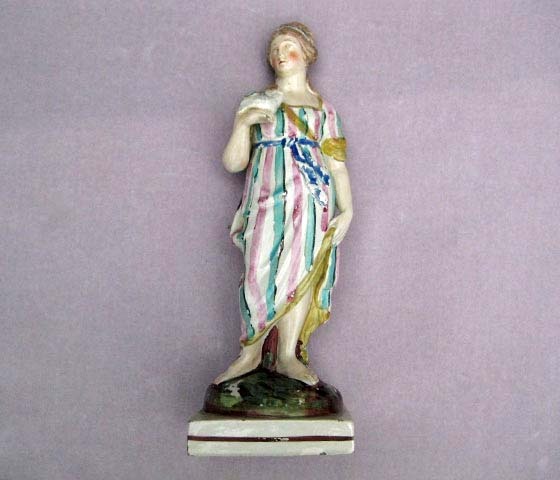 S2991: A brightly painted figure of Summer after a Wood model. 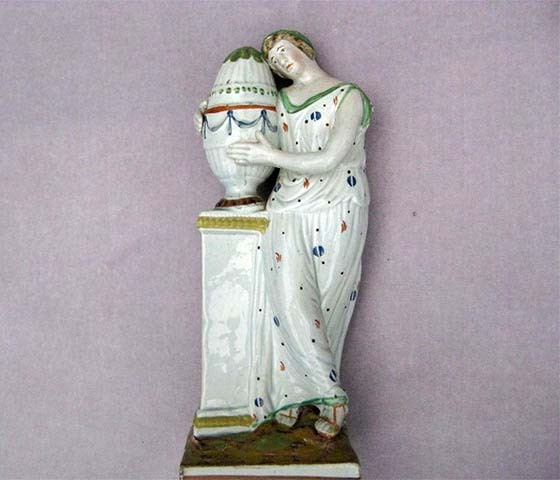 S2992: A classical pearlware figure of Andromache weeping over the ashes of Hector. 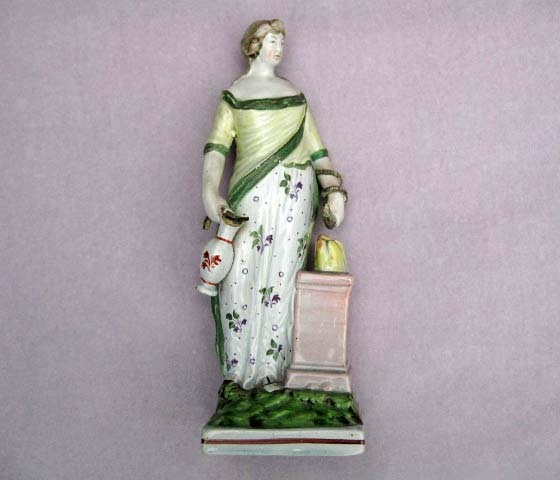 S2993: A pearlware figure of Medea at the altar of Diana. 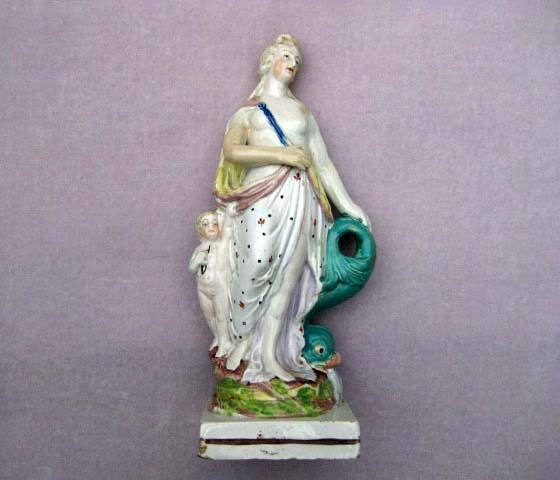 S2994: A pearlware figure of Venus with a young child and a dolphin spewing water. 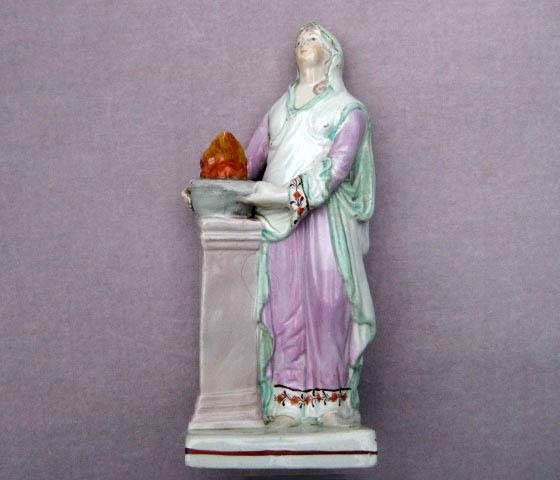 S2996: A pearlware figure of Hygieia, the goddess of healing. 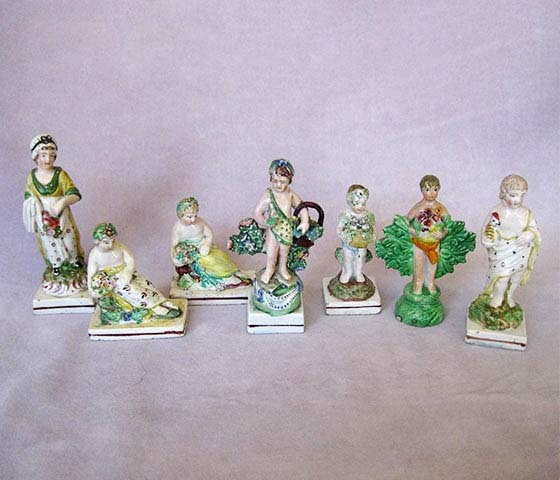 S2997-3002 : a group of seven small early C 18 th. 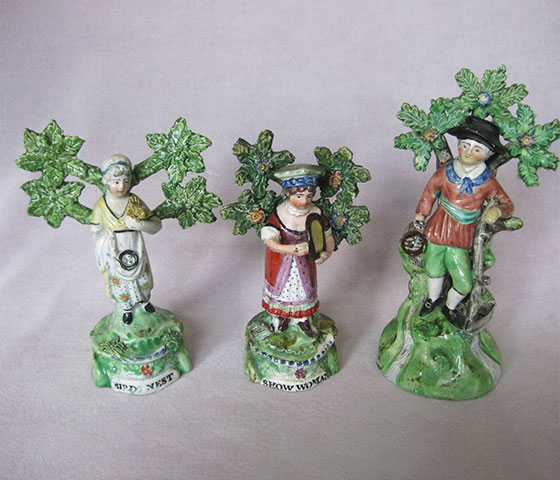 Staffordshire figures. 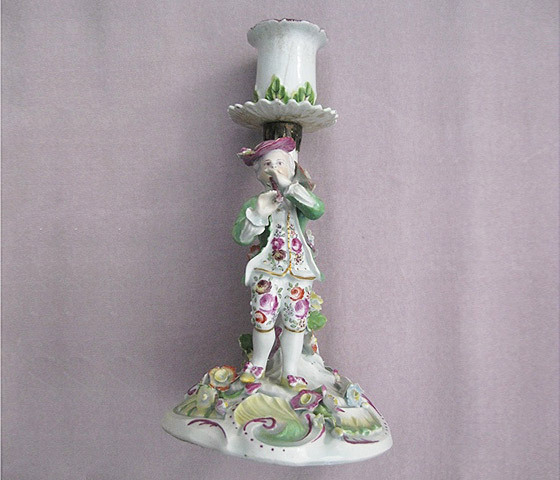 S3004: A Derby figure of a young Harlequin standing beneath and beside a bocage on a rococo base. 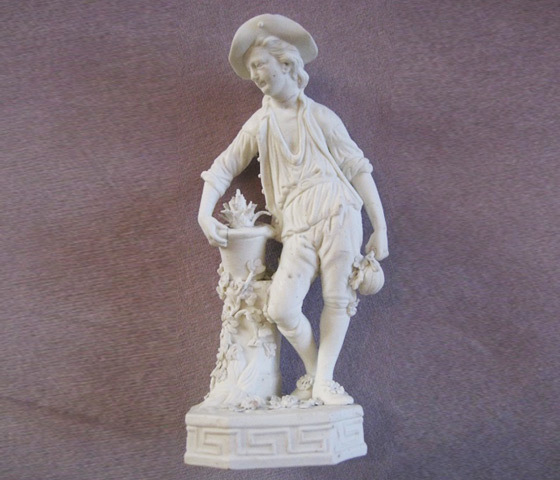 S2793: A fine Staffordshire model showing Captain James Cook 1728-1779.Taken from an engraving by W Holl after a painting by Nathaniel Dance RA and executed in 1776.